The online version of this article ( https://doi.org/10.1186/s12977-019-0472-3) contains supplementary material, which is available to authorized users. Potent combination antiretroviral therapy (cART) suppresses the plasma viral load of HIV infected patients to undetectable levels. As a result the quality of life has improved significantly and the number of AIDS-related deaths has drastically declined worldwide . Still, globally HIV remains the major cause of death among women between 15 and 49 years old . Moreover, it is challenging from a logistic and economic point of view to provide over 36 million HIV positive patients worldwide with a lifelong treatment [2, 3, 4]. In addition, drug related side effects hamper adherence to therapy and allow the emergence of drug resistant HIV strains [5, 6, 7]. Therefore, the development of new strategies towards a cure of HIV infection is crucial. The major barrier towards such cure is the persistence of integrated provirus residing mainly in long-lived latently infected memory CD4+ T cells responsible for a rebound in viremia upon treatment interruption [8, 9, 10]. Although no consensus exists about its relative importance, homeostatic proliferation and clonal expansion of infected cells contribute to viral persistence even under cART [11, 12, 13, 14, 15, 16, 17]. 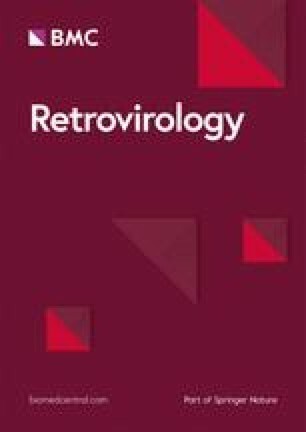 Low levels of ongoing viral replication in anatomical sanctuaries with limited drug penetration like the central nervous system, gut associated lymphoid tissue and the lymph nodes may maintain the reservoir as well [18, 19]. Integration of the viral DNA into the host genome is a crucial step in the formation of the proviral reservoir. It is catalyzed by HIV integrase (IN) (For a Review see ) with the help of Lens epithelium-derived growth factor (LEDGF/p75). LEDGF/p75 is a transcriptional co-activator that binds IN and tethers the pre-integration complex (PIC) to the chromatin [21, 22, 23, 24, 25, 26], facilitating integration into transcriptionally active regions . LEDGF/p75 is not the only determinant of integration site selection . 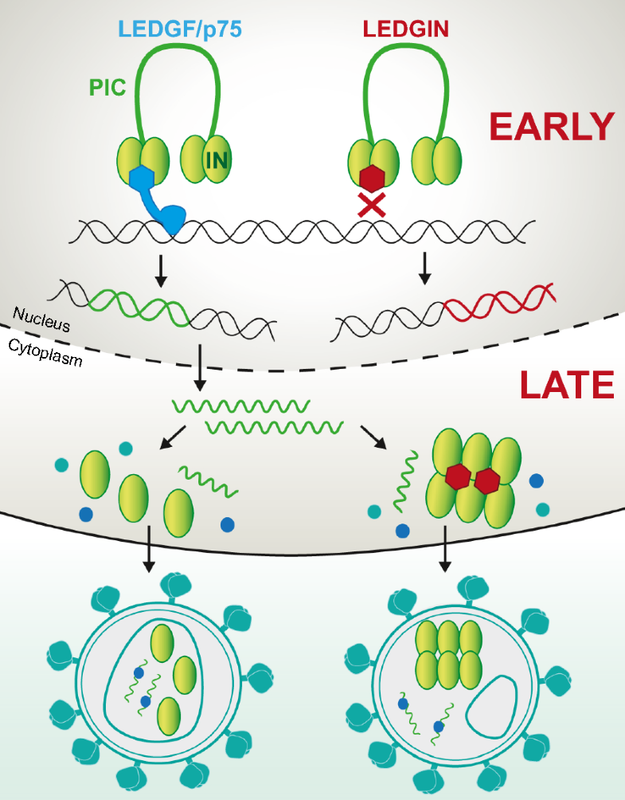 Nuclear import of HIV through nuclear pore complexes (NPC)  is a first important step that determines the path through which a PIC enters the nucleus [30, 31]. HIV-1 integration preferentially occurs in the nuclear periphery [32, 33] in active chromatin regions close to the nuclear pore, while inner nuclear or heterochromatic regions are apparently disfavored [34, 35, 36]. Depletion of several NPC associated proteins (Nup98, Nup153, Transportin-3, RanBP2 and Tpr) hampers integration in gene dense regions [36, 37, 38]. Cleavage and polyadenylation specificity factor 6 (CPSF6) is another cellular cofactor that promotes nuclear entry through its interaction with the HIV capsid protein [39, 40, 41]. Depletion or knockout of CPSF6 affects HIV integration in active genes [42, 43, 44, 45]. Active genes are characterized by an open chromatin landscape and specific epigenetic histone modifications such as H3K36me3, the recognition mark of LEDGF/p75 [46, 47, 48]. Moreover, it was recently found that HIV IN directly interacts with the amino-terminal tail of histone H4, which promotes its anchoring to the nucleosome and facilitates integration . Additionally, HIV IN shows a weak preference for a conserved sequence logo at the site of integration [50, 51, 52]. As multiple determinants target HIV integration to transcriptionally active regions, the question is raised whether the integration context influences HIV transcription. Previously it was shown that depletion of LEDGF/p75 retargets integration out of active genes [53, 54, 55, 56, 57]; these integrants proved to be more transcriptionally silent and refractory to reactivation . Additionally, the LEDGF/p75-IN interaction can be specifically inhibited by small molecule inhibitors [58, 59, 60, 61], referred to as LEDGINs . LEDGINs abrogate the binding of LEDGF/p75 to HIV-1 IN by binding to the IN dimer interface and allosterically inhibit the catalytic activity of IN (the so-called ‘early effect’, Fig. 1) . Later it was found that LEDGINs also inhibit late stage replication (the so-called ‘late effect’, Fig. 1) [63, 64, 65, 66, 67, 68]. Viral particles produced in the presence of LEDGINs display morphological defects due to LEDGIN-induced IN multimerization [63, 64, 65, 66, 67]. Many particles contain a delocalized ribonucleoprotein outside the capsid core or even lack a core. These crippled viruses are hampered during the next round of infection at the level of reverse transcription, nuclear import and integration [63, 64, 65, 66, 67]. 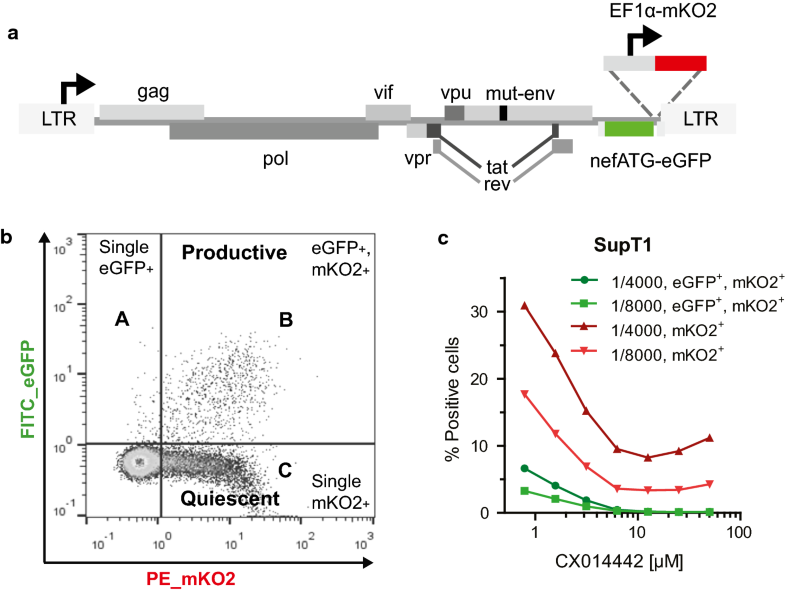 In 2016, LEDGINs were used as a tool to investigate the link between LEDGF/p75-mediated targeting and the transcriptional state of the provirus. LEDGIN treatment during early replication shifted residual integration out of transcription units in a dose-dependent manner . In addition, the integrated provirus relocalized towards the inner nuclear compartment. Furthermore, the proportion of provirus with a transcriptionally silent phenotype increased, while the reactivation potential was reduced . Of interest, Chen et al. used a barcoded HIV vector to experimentally prove that integration sites affect reactivation of the provirus when stimulated with different LRAs. Moreover, the chromatin functional state of latent HIV provirus also influences latency reversal . Collectively, these results indicate that HIV-1 transcription is affected by integration site selection. To elaborate this hypothesis, we now investigated the late effect of LEDGINs on integration site selection and HIV-1 expression. In this study, we infected cells with HIV produced in the presence of LEDGINs and determined integration sites and reactivation potential. The fact that LEDGINs inhibit the late replication steps at a lower dose than the early steps [64, 65, 66, 67, 68], underscores the translational relevance of this question. 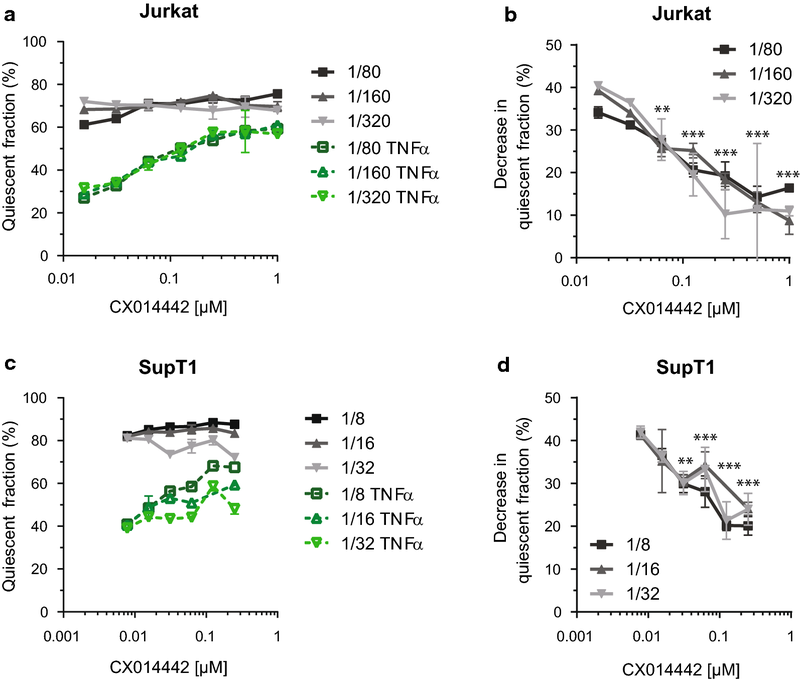 LEDGIN treatment during virus production effectively altered immediate quiescence and the activation potential both in cell lines and primary CD4+ T cells. Although targeting to H3K36me3 and active genes, were unaffected, the residual integration sites were less favored near features associated with active transcription, reminiscent of a more latent chromatin landscape. These data suggest a LEDGF/p75-independent mechanism generating the silent phenotype observed after LEDGIN treatment during virus production. LEDGIN treatment during infection was recently found to affect integration site distribution with an impact on transcription of the provirus . Here we investigated whether the quiescent phenotype of residual provirus after production in the presence of LEDGINs is associated with an altered integration site distribution. SupT1 cells were transduced with an eGFP expressing lentiviral vector that was produced in the presence of a dilution series of LEDGIN CX014442. Flow cytometry confirmed a dose-dependent inhibition of transduction by CX014442 treatment during production of the vector (Additional file 2: Figure S5). Integration site analysis of cells transduced with a 1/20 vector dilution is represented as a genomic heat map (Fig. 6) that plots whether a certain genomic feature is (dis)favored near the integration site compared to matched random control sites . This correlation is visualized by the color scale: favored features relative to matched random control sites (MRC) are plotted in pink, while blue represents features that are disfavored compared to MRC. Statistical significance calculated by the Wald test is shown for all LEDGIN conditions relative to the DMSO data set (Fig. 6). Consistent with previously published data [27, 57, 73, 74, 75], integration was favored in refSeq genes (76.43%) in the absence of inhibitor (Additional file 1: Table S2). CX014442 treatment in producer cells did not significantly affect integration in refSeq genes (‘within_refSeq_gene’, Fig. 6 and Additional file 1: Table S2). Still, the occurrence of refSeq genes within a distance of 100 kb and 1 Mb of the integration site was significantly lower compared to the DMSO control (‘refSeq_counts’, Fig. 6). Furthermore, integration was somewhat less favored near DNaseI sensitive sites, CpG islands and in GC rich regions when producer cells were treated with CX014442 compared to the DMSO control. Next, sequencing data were analyzed for various epigenetic features, resulting in an epigenetic heat map (Fig. 7). In line with earlier reports , for the DMSO control, integration preferentially occurred near markers for active transcription (e.g. 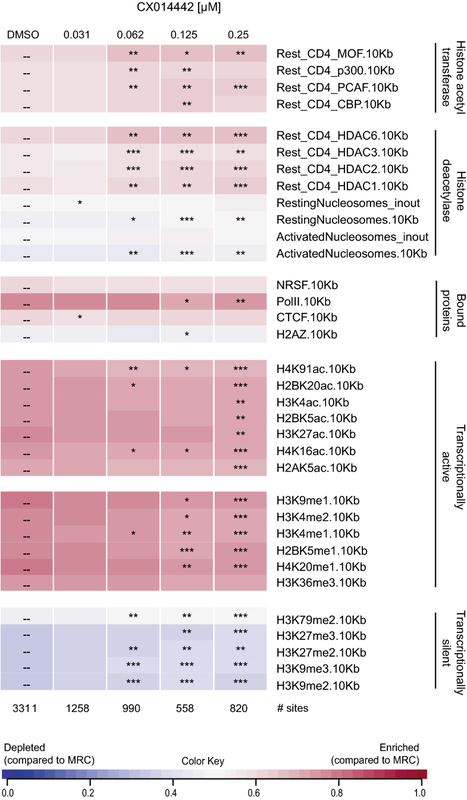 H4K91ac, H4K16ac, H3K4me1, H3K4me2), while integration in transcriptionally silent regions (e.g. H3K9me3, H3K27me3) was disfavored. Addition of CX014442 during vector production resulted in a distinct chromatin environment that was characterized by less active transcription markers and an enrichment in markers for transcriptionally silent regions (Fig. 7). Remarkably, integration near H3K36me3, the epigenetic feature recognized by LEDGF/p75, was not altered upon addition of CX014442 during vector production. Similar results were obtained for SupT1 cells transduced with a 1/40 dilution of the vector (Additional file 2: Figures S6 and S7). These data indicate that LEDGIN treatment during vector production results in a more latent chromatin landscape of the residual provirus. The latent HIV reservoir is the main target for different HIV cure strategies . The so-called shock-and-kill strategy aims to reactivate latent provirus with latency reversing agents (LRAs) and subsequent killing of the reactivated cells by viral cytopathic effects or by immune clearance [76, 77, 78, 79, 80, 81]. So far results are hampered by insufficient potency and toxicity of latency reversing agents (LRA) [82, 83, 84, 85]. It was shown that LRAs reactivate less than 5% of latent provirus  and that the response to different LRAs depends on the site of integration . This might explain the limited success of the shock-and-kill strategy. Therefore, it remains important to explore other cure strategies. Recently, a novel block-and-lock strategy was proposed that aims at locking the residual virus into a ‘deep’ latent or transcriptionally silent state lacking the capability to rebound upon cART cessation [57, 76, 86, 87, 88, 89, 90, 91, 92]. This deep latent state can be achieved in several ways. HIV transcription can be abrogated by inhibition of trans-activator of transcription (Tat) [86, 87, 88]. Alternatively, HIV expression and reactivation can be inhibited by LEDGIN-mediated retargeting of HIV integration to sites that are less susceptible to reactivation . To achieve an HIV cure via any of the discussed strategies, it is important to understand the role of integration site selection in HIV latency and reactivation. In this study, we further explored this relation by investigating the late effect of LEDGINs on residual HIV integration and expression. LEDGINs were added during virus production (late effect), resulting in crippled progeny virions with an enhanced IN oligomerization [64, 65, 66, 67]. First, we confirmed that LEDGIN treatment in producer cells reduces infectivity of the progeny virus in the next round of infection when using a dual colored reporter virus. These results are in full agreement with previously published data on the late effect of LEDGINs [64, 65, 66, 67]. Next, we evaluated whether LEDGIN treatment during virus production alters HIV expression. After treatment with 0.25 µM LEDGIN CX014442 97% of residual provirus in Jurkat and SupT1 cells was in a quiescent state and less susceptible to reactivation. In the DMSO control only 70–80% of infected cells were quiescent. This result phenocopies the effect seen with LEDGIN treatment during infection . In MT-4 cells the quiescent fraction was also augmented with increasing concentration of CX014442. Whereas in the DMSO condition less than 10% of provirus was quiescent, treatment with 0.25 µM of LEDGIN increased the proportion of silent provirus up to 50%. Notably, the extent of eGFP expression in the DMSO control samples varied among cell lines due to different activation of the LTR promoter. This emphasizes the importance of comparing latency and reactivation phenotypes in multiple cell lines in parallel. The MT-4 cell line is transformed with human T cell lymphotropic virus type I (HTLV-1), activating the host T cell . Since MT-4 cells already constitute an active cell line, it is more difficult to achieve additional activation. In fact, we found that more than 90% of the MT-4 cells in the DMSO control were productively infected, and therefore MT-4 cells were not included in the reactivation experiments. Next, we investigated whether retargeting of integration sites can explain the quiescent phenotype observed with viruses produced in the presence of LEDGINs. LEDGF/p75 is the main tethering factor guiding HIV to active transcription units  and depletion of LEDGF/p75 or disruption of its interaction with HIV IN is known to shift integration out of active genes [53, 54, 55, 56, 57]. Interestingly, CX014442 treatment during virus production did not significantly alter the percentage of integration in refSeq genes or near H3K36me3, the recognition mark of LEDGF/p75, in contrast to integration sites obtained with CX014442 treatment during early infection (Additional file 1: Table S2, data from ). The crippled viruses likely still depend on LEDGF/p75 for integration. When comparing integration sites after early or late LEDGIN treatment a similar pattern is observed (Additional file 1: Table S4). In both cases, integration becomes less favored near DNaseI, CpG islands and active transcription markers, while integration near transcriptionally silent markers is enriched upon addition of LEDGIN CX014442. 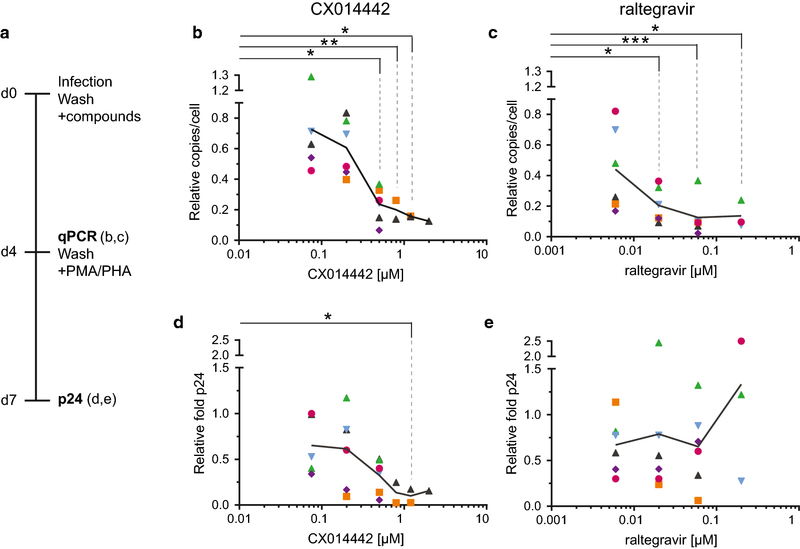 Integration sites obtained after CX014442 treatment during virus production or during early infection of cells are both less favored in GC rich regions, although the effect is more pronounced when CX014442 is added during production. 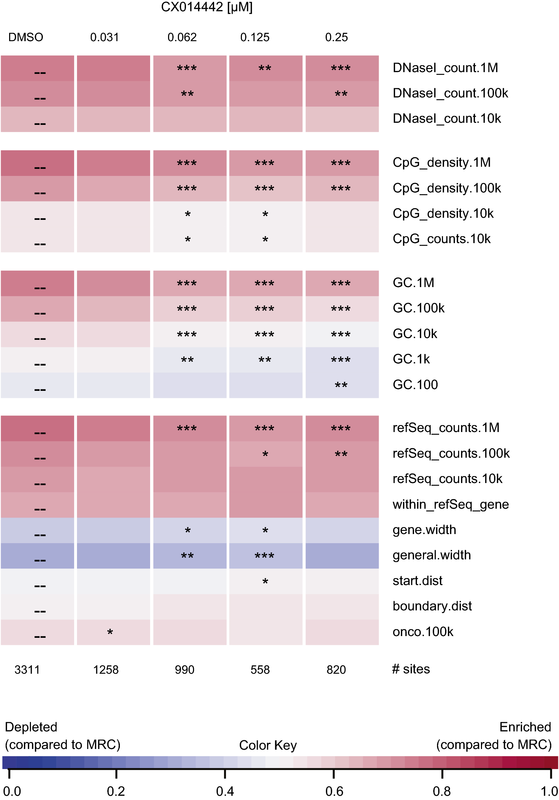 Overall, it seems that the main difference lies in targeting to refSeq genes. The IC50 value for the late effect of LEDGIN CX014442 is much lower, only up to 0.25 µM of compound was added during production. For the early effect, concentrations from 0.78 up to 50 µM were used (Additional file 1: Table S2). Higher concentrations of LEDGIN are thus required to shift integration out of refSeq genes. Changes in the chromatin environment on the other hand, already occur at the low LEDGIN concentrations used during production. Since these low concentrations are sufficient to cause the latent phenotype, the data suggest that a mechanism other than pure retargeting by LEDGF/p75 is involved. This is in agreement with our previous observation that the LEDGIN induced quiescent phenotype is stronger than the mere effect on retargeting . Enhanced IN oligomerization is a common feature seen both for early and late effect of LEDGINs and might play a role in this latent phenotype. Using Förster resonance energy transfer (FRET) we previously demonstrated a LEDGF/p75-dependent increase in IN multimerization in the nucleus . Upon knockdown of LEDGF/p75, this phenotype was rescued by addition of LEDGINs during infection of the cells . Moreover, LEDGIN treatment during virus production enhances IN oligomerization prematurely in the viral particle, and these multimers are retained in the cytoplasm and nucleus after infection of target cells [64, 94]. Although enhanced/premature IN oligomerization may not affect targeting by LEDGF/p75, it might still influence in which chromatin environment integration takes place, for instance by a direct interaction between IN and histone amino-terminal tails . The exact mechanism remains to be clarified. Additional file 2. Additional figures.